TIVOLI, Italy–I arrive at Tivoli on April 13th after a 15 hour KLM flight from Tokyo, where I was on vacation with my family and doing research at the Tokyo Institute of Technology. I met up with an Italian engineer, Ilbe Salvaterra, from our partner company, Global Risk Consultants at the Rome airport at 9:30 pm. It is always nice to have a good local engineer on our reconnaissance team to investigate a disaster area. Ilbe rented a car and we drove to the town of Tivoli. This is a beautiful resort town with a lot of green rolling hills and strong smell of sulfur. 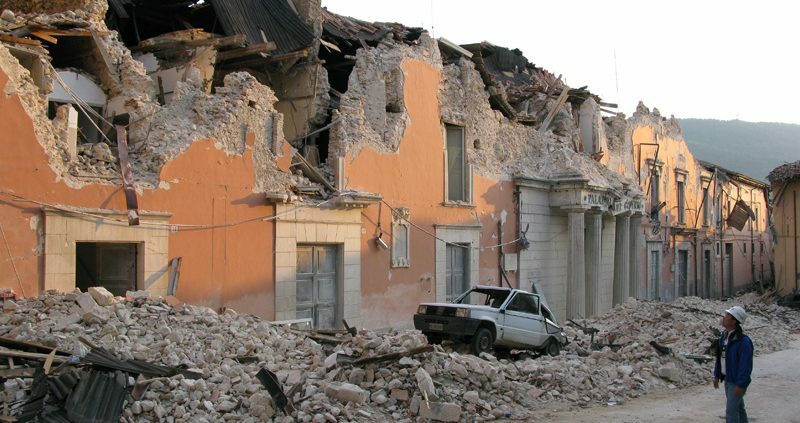 It is about 25 km northeast of Rome and 60 km to the epicenter near L’Aquila. 60 km is close enough to commute to and far enough to be safe from large aftershocks. We got to the hotel at 10:30 pm and met Peter Yanev, the third member of our team from our Lafayette, California office. Peter arrived in the late afternoon and was enjoying many glasses of Italian wine while waiting for us. We had a difficult time finding a restaurant since today was the Monday after Easter and everything was closed. After a simple dinner, I went back to my hotel room and corresponded with California until 3 am. This is not an easy job. After 4 hours of sleep, all three of us met at the hotel lobby at 8:30 am, took a quick breakfast, and left for L’Aquila. We drove on a modern, but somewhat bumpy highway through a beautiful countryside of green rugged hills covered with olive trees and dotted with ancient villages. Earthquake country almost always looks the same – beautiful ragged, but peaceful mountains. This was true in Sichuan, China, Sumatra, Indonesia, Romania, Japan, and California. Unfortunately, these peaceful places will turn to hell in an instant, without any warning. The scenery changed to higher mountains with steep terrain. I saw white topped mountains. The mountains here go up to 3000 meters. These ranges look like the high peaks of our Sierra Nevada in California. The differences from California are the many ancient villages perched on top of smaller hills in valleys. It is astonishingly beautiful. We stopped at a gas station for a quick rest right before the epicenter. Peter noticed a few concrete benches had moved laterally about 0.5 inch or so by the earthquake. The disaster zone was getting closer. 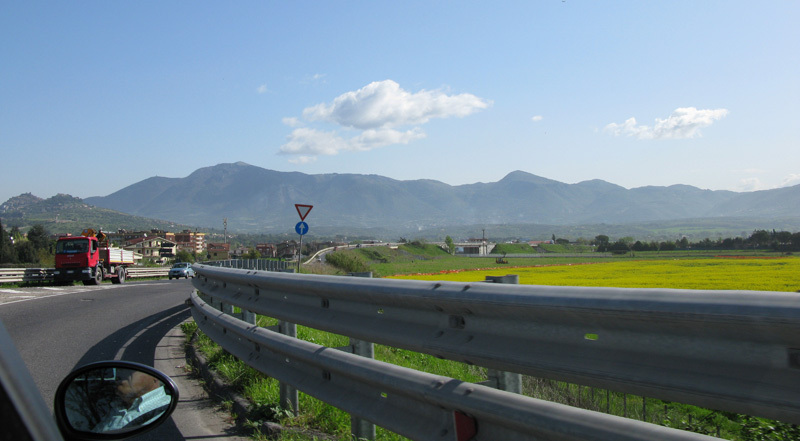 We drove into L’Aquila. At 11:25 a.m. we witnessed the first major earthquake damage along the road near the highway exit. A 4-story concrete apartment building that did not collapse, but masonry walls at the first and second floors had crumbled to the ground. 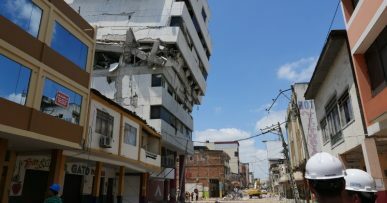 In this area, many residential and commercial buildings have a concrete-beam-and-column system to carry both gravity and earthquake forces to the ground. We call this a moment frame system. 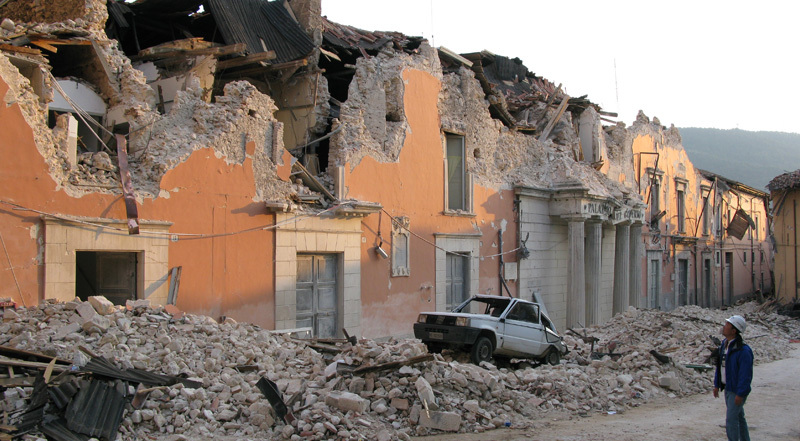 The spaces between the beams and columns are then filled with unreinforced masonry to create the architectural walls. Unfortunately and unknowing to the builder, these walls stiffened this building and took almost all earthquake forces. But the walls were not engineered for it and collapsed. This damage rendered the building inhabitable. 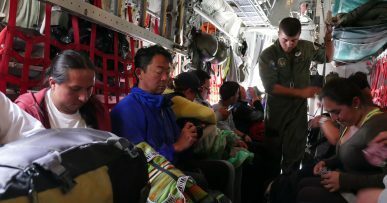 This is a well known phenomenon; which again injured and killed a score of people in this earthquake. Approaching the high peaks that reminded us of the Sierra Nevada Mountain Range in California. At 12:05 p.m. we parked our car at the army and police guard gate, which goes to the old town center. I saw much local TV coverage that showed intense damage in this area. Since the buildings in this area were so unstable and dangerous, the whole old city center was off limit to unauthorized personnel. A fire chief stopped us and asked us to come back later today to investigate the cordoned area. We drove up to a hill top residential area that we had spotted damaged buildings. It appeared that buildings at hilltops were more severely damaged than ones in the low lands. Peter Yanev explained that this effect is focusing. At hilltops, earthquake energy can be intensified or focused. I observed this in the 2007 Sumatra earthquake. We saw dozens of midrise buildings with damage ranging from collapsed infill walls to minor cracking. We also saw many brick houses, where the wall corners cracked and collapsed. Corners are dangerous areas for brick construction. Walls from orthogonal directions restrained each other and cause failure. Moment Frame system allowed the earthquake and gravity forces to flow to the ground. 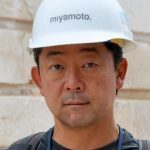 he same building system killed thousands of school children in 2008 Sichuan, China earthquake. Different country, but the same dangerous building type kills many. At 1:35 p.m. we met a couple of professors from the local L’Aquila University. Peter knew them from UC Berkeley. We followed their cars to their engineering school at the top of hill. They told us that there was major damage to their school buildings. This campus is located at one of the most beautiful places I have ever seen. 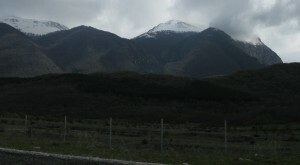 The hill is surrounded by snow capped mountains and green valleys. The professors showed us a modern 4-story concrete structure built about 10 years ago. I was able to see some wall damage from the outside. I then decided to investigate the interior. Peter and Ilbe followed. Then in came an architect who told us that he was the architect of record for this building. There was incredible destruction inside. 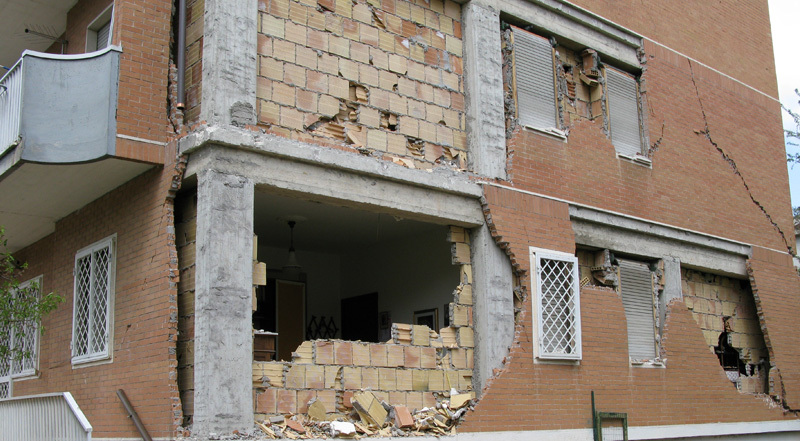 Many architectural concrete masonry walls collapsed. So did suspended ceilings. Simply, there were no connections or braces to stabilize these walls and ceilings. Debris rained on to the ground level lobby where many students would gather during the day. I saw one concrete masonry wall collapsed onto the students desks. This wall was a party wall between class rooms. 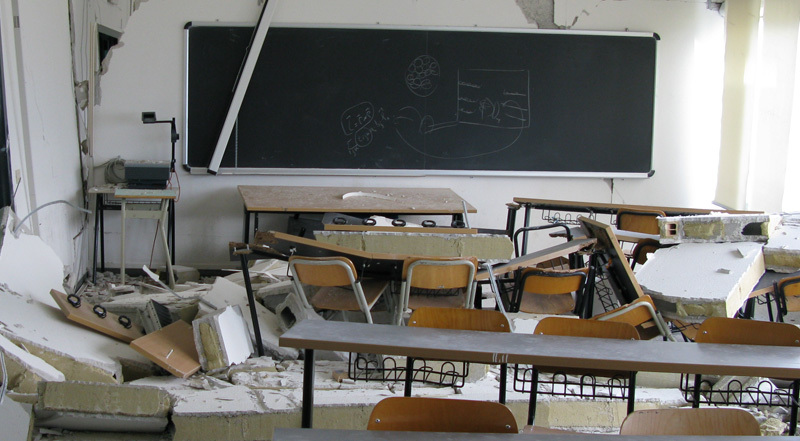 If this earthquake had happened when class was in session, it would have killed many students. I saw terror in the architect’s eyes. The building didn’t have much structural concrete frame damage, but we as engineers failed the public that it was suppose to protect. In the midst of this damage was a continuous eerie alarm that echoed in this abandoned building. We next entered the older faculty building. We were told that this 5-story building was built in the 1930s. I saw less architectural damage in this older building. 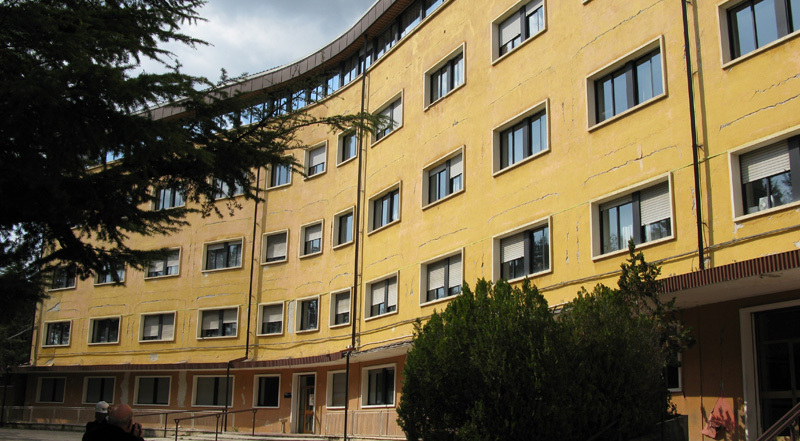 It was constructed of concrete frame with infill masonry walls. These walls helped to dampen the earthquake forces. One of the professors went up stairs with us. He led us to his old office at the third level where the infill wall was heavily damaged and collapsed on his desk. He removed his young son’s picture from the wall and we soon departed. We now are heading back to the cordoned old city center where many buildings collapsed, including a modern student dormitory.